And finally... the reason why I bought this magazine. 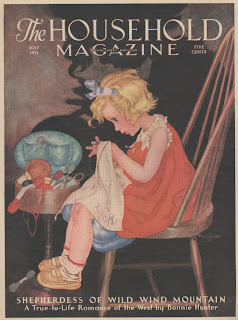 A cover by Gustaf Tenggren! Make sure you get Illustration magazine #21 wich features lots of his artwork. Got a few more 1930's Tenggren covers. If there's interest I can try to find them in my archive. Next post: Back to 2008! 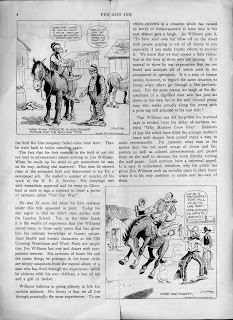 Two illustrations by Charles Overman. Just black, white and red. My three favourite colors. Simple and effective if you know how to use them right. And incidentally exactly the three colors I'm dressed in today. 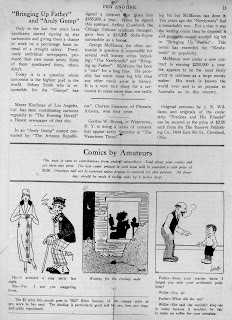 A comic ad by Fontaine Fox, most famous for his Toonerville Trolley. 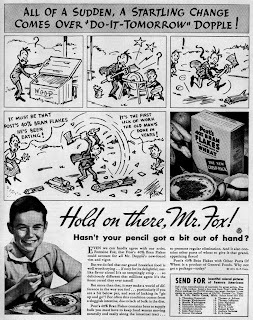 A Mr. Coffee nerves ad. 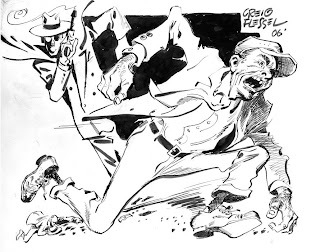 This is the only one not by Milton Caniff or Noel Sickles I've seen. But I bet there are plenty out there. 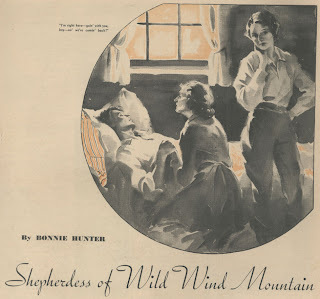 More art from The Household Magazine May, 1935. 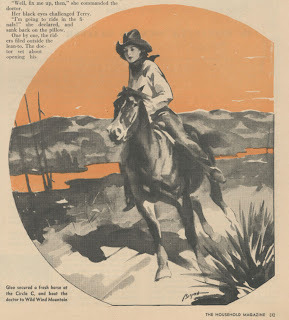 This time it's two story illustrations by Harold E. Bryant. /Joakim, who is on a vacation ut is using "remote posting" to put things up on the blog. 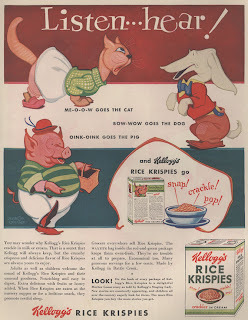 Lets begin with an ad for Kelloggs by no one else than Vernon Grant! Got this animation from Hedvig featuring her character Milli and I just had to share it with you. Click on image to see it move. 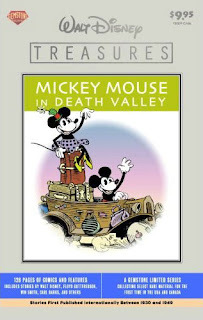 Watch out for this volume of Walt Disney Treasures featuring "Mickey Mouse in Death Valley"! It's scheduled for december 10 but it will be worth waiting for since you will see this adventure in a newly restored version. 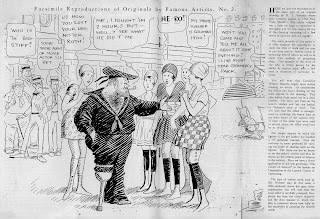 Details that was muddied up by cheap newsprint and not seen since the original artwork was made will now be seen. 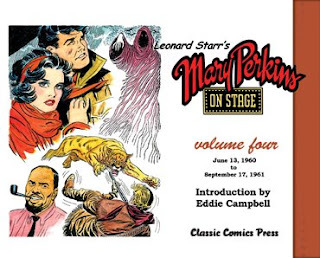 So you will want this edition even if you have the old oversized books or the German Gottfredson portfolio. David Gerstein (editor) wrote: " What you've pictured there is the very first cover for the book, [...] It was then intended as a 128-page book at slightly smaller size, thus the $9.95 cover price. Still way to hot here to work, but I managed to do a bit of penciling today anyway. Well, you be the judges if I succeded or not. They are showing Persepolis in Folkets Park here in Malmö at 22.00 tonight. Admission is free, so get there if you're in town. But leave a seat for me. OK? 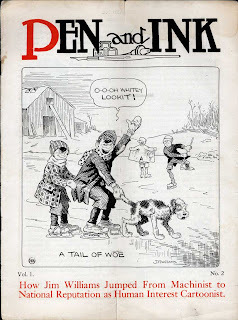 Here's the final post of scans from Pen and Ink no. 2. Hardie Gramatky (1907-1979) went on to be a successful painter and writer of childrens books. 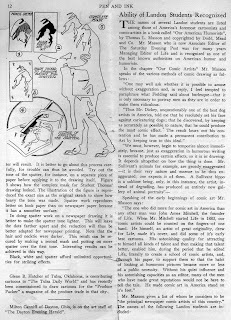 Most famous for his creation "Little Toot" (six books written between 1939 and 1979) wich was animated at Disneys and also featured in the Disney comic books. 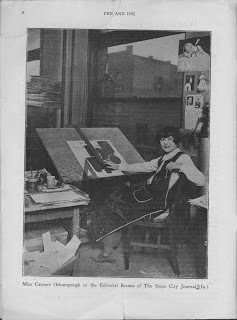 "Hardie began working at the Walt Disney Studio in 1929, two years after the Studio began. He went to Chouinard art school at night and to the Studio during the day. 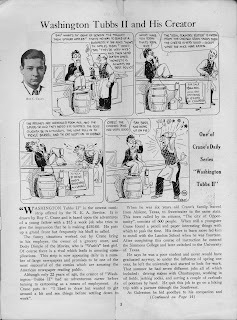 His first job was to do a Disney comic book, but he finished six months of drawings in three days when Walt asked him, 'Gee, Hardie, what would you like to do now?'" Now, what I wonder is what comic book that would have been? In 1929? 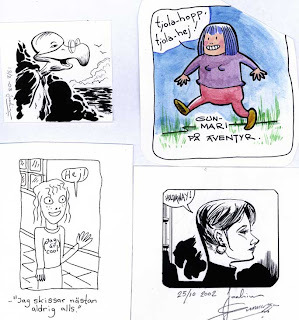 Since last post I've pencilled a half page, eaten some food, been listening to Liv Strömkvist reading ten of her comics at the Möllevångsfestival, been inking (rather unsuccessfully I have to admit) bits and pieces of the half page and done a watercolor test. The first attempt at using watercolors for many, many years. Will try to learn how to do it properly. But for now this first step will have to do. Now I'm tired. Gotta go home and call Hedvig before it's getting late. 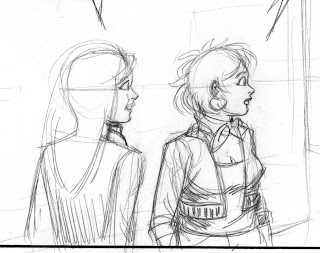 Just began to pencil a new E&S page. But the sun is shining here in Malmö and it's too damn hot today. Here are pages 10, 11 and 12. 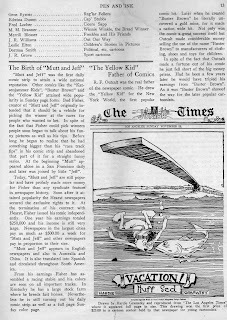 Notice the mention of Milton Canniff [sic!] on page 12. 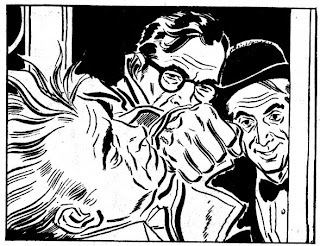 The same Milton that ten years later drew Dickie Dare for AP? He would have been only 17 in '24, but it might be him. 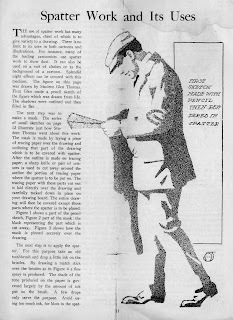 The final post of Pen and Ink #2 will feature Hardie Gramatky, "Bill" Blum and market news. Stay tuned! 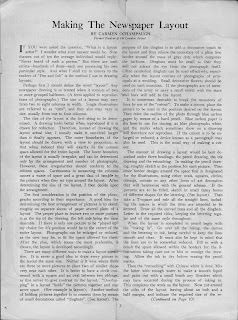 Here's the third part (of five) of the 1924 issue of pen and ink, featuring a spread by H. T. Webster. Anyone who has more issues and wants to share? [The text on hte colored one reads: Hi-diddeli-dee! Gun-Marie on adventures. 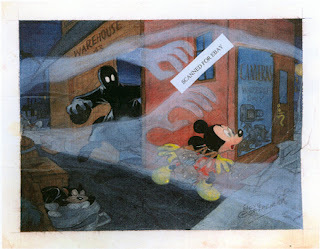 So, you think you've seen all of Floyd Gottfredson's watercolor paintings of Mickey Mouse? The above piece is not in Willits auction catalouge. Looks like a test version for one of the Phantom blot paintings. Looking colosely you can see that it has tears and wrinkles, so I guess that Gottfreson wasn't satisfied with it and junked it. But someone saved it and put it up on eBay some years ago. I didn't get it so all I have to show is this scan from a printed eBay page. Anyone who knows who owns it? Would be nice to see it published. 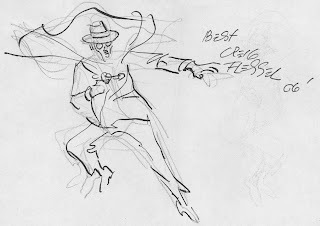 Just got the news that Creig Flessel passed away a few days ago. Below are two pieces I got from him 2006. Search Comic Art Fans for his stuff and you'll find lots of good artwork. 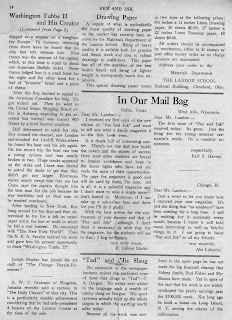 Here are the first three pages. The rest will follow tomorrow and next week. 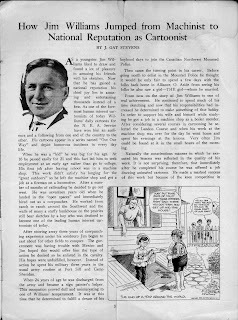 Coming up tomorrow: A feature on the 22 year old Roy Crane, from the very same 1924 issue of Pen and Ink! 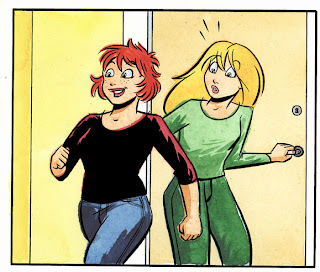 For episode #183 of "Emma & Sara" Hedvig went for a more cartoony style, as seen above. I've soon finished inking the page and after the logo is made it's time to begin writing #185 while she draws #184. 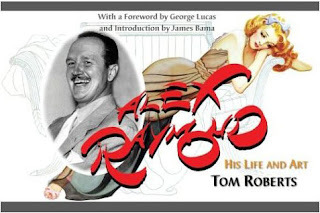 Tried to find the early Rip Kirby stories by Alex Raymond in my bookshelf today when I stumbled upon this cover. Digging further down the pile of old comic books this one turned up! 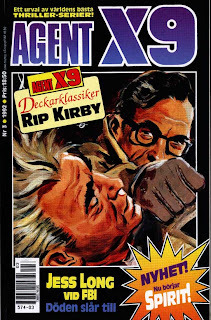 This is the cover of Agent X9 published more than 20 years after the above cover. 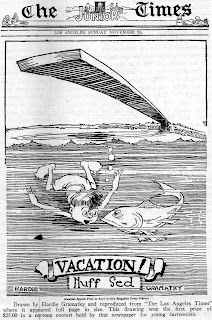 The same illustration used again to a different story! Also, notice how different the colors reproduce on the two versions, even if they obviously are taken from the same painting. 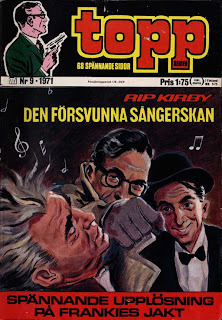 I don't know who made the cover art but it was based on this panel, found in Toppserien. "Just a quick review for those of you still hesitating wether you should buy this book or not. It's loaded with rare artwork and photos of Raymond in action. The selection of drawings are not the usual dailies or sunday pages (Even if there are a few of those too.) but it's mostly rare and/or previously unseen stuff. 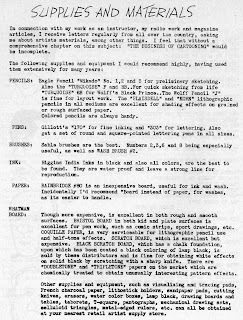 Several of these "unpublished" pieces has actually appeared in Russ Cochrans "Graphic Gallery", but that was a long time ago. 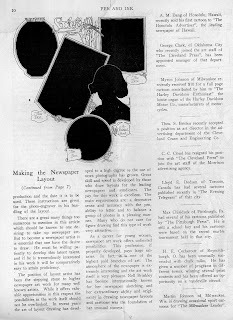 The black and white images could have been so much sharper reproduced. Too bad on an otherwise excellent book." 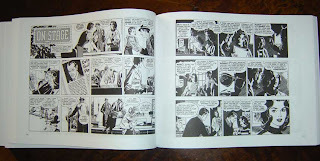 Let's hope someone will do a complete reprint of Raymonds ten years on the strip. It's a thick volume. 264 pages!!! 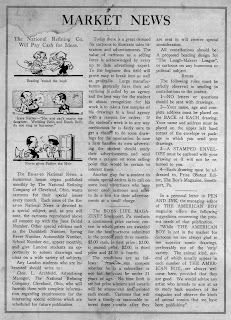 Reprinting dailies and sundays from June 13, 1960 to September 17, 1961. 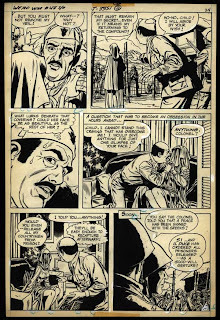 Beautiful artwork by one of the best "photorealistic" comic strip artists of all time. It also got a lenghty interview with Starr and a bonus gallery of rare stuff. Took a few snapshots of the contents just to show you what to expect. First half of the page that will appear in Julia #17/08. I'm only showing the first half because I drew a guy on the second half. 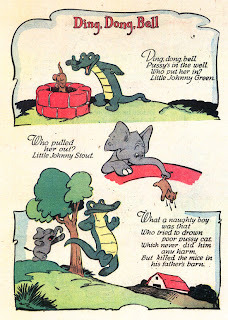 No, it's Little Johnny Green. 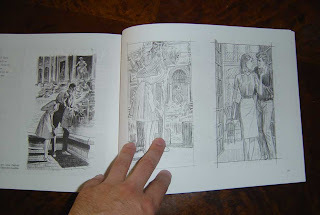 As a follow up to the previous posts with artwork by Bill Draut, here are two pages from his "The furnished room". As the years went by he really thigtened up those brushstrokes without losing the sense of spotting black areas. 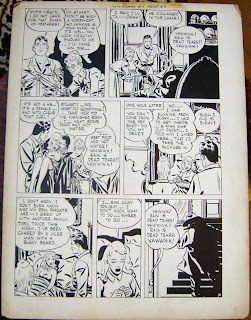 And you can still see the Caniff/Sickles influence. Good stuff. 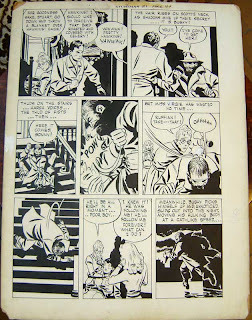 I wonder who ended up with all of Frank Robbins "Johnny Hazard" dailies. 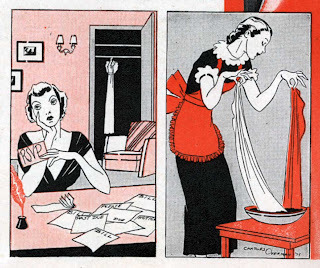 I see his 70's dailies quite often but his strips from the 40's are harder to find. 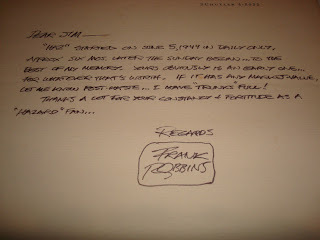 But judging from this letter sent to Jim Logan (that I saw on eBay last year) he obviously had "trunks" full of early ones. Just wish they would appear more frequently on the market. 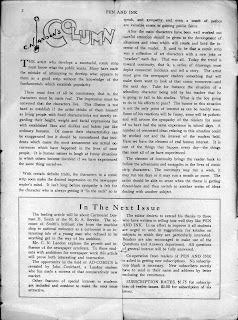 One last page focusing on the materials used in '39.